First lady Michelle Obama announced a series of proposed changes to US food labelling rules that seek to tackle the fact that the average serving sizes used to calculate calorie intake have lost track with the reality of modern American appetites. If the alterations are adopted, drinks companies, for example, would no longer be able to treat a 20oz bottle of soda as containing 2.5 servings of 8oz each for the purpose of labelling estimated calorie levels. Instead, both 12oz cans and 20oz bottles would each have to be treated as a single serving, and the calorie estimate displayed prominently on the label will increase by 50% or 150% accordingly. 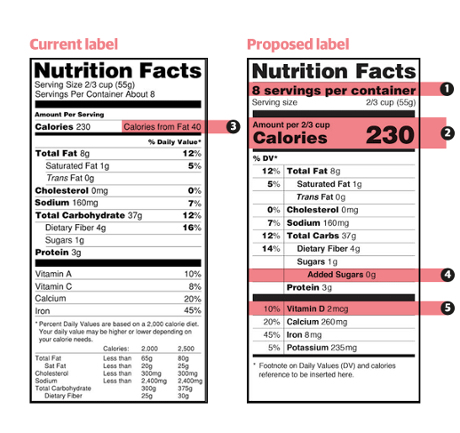 In total, the new changes proposed by the Food and Drug Administration and announced by Michelle Obama at a White House event, will affect 27 of the 157 product categories governed by portion rules. In some categories, serving sizes will go down. Average consumption levels of yoghurts, for example, have typically shrunk from 8oz servings to 6oz servings, according to FDA research, and the labelling would change to reflect that. But in most cases, serving sizes will jump. A portion of ice cream, for instance, would now be measured as a cup, rather than half a cup. Health officials hope the move will encourage consumers to take a more sober look at their eating habits. FDA officials acknowledge that the move may prove controversial for some in the food industry, whose lobbyists have long fought efforts to tighten labelling rules, and industry “stakeholders” will be invited to comment before the FDA can proceed. Side-by-side: (1) New serving sizes. (2) Calorie count given larger and bolder typeface. (3) Calories from fat no longer listed separately. (4) Extra line to spell out added sugar. (5) New listing for vitamin D and potassium. An even bigger fight with the food industry is expected over proposed changes to how sugar levels are displayed on packaging. Under the planned new rules, manufacturers would be forced to estimate how much extra sugar they have put into natural food products, and to keep records for at least two years so they can prove the difference between natural and added sugars if challenged by the FDA. While these small changes seem possitive a much bigger concern has arizen when it comes to USDA regulation of Organic labeling and Genetically Engineered (GE) crops. In its email of Jan. 21, 2011 WFM calls for "public oversight by the USDA rather than reliance on the biotechnology industry," even though WFM knows full well that federal regulations on Genetically Modified Organisms (GMOs) do not require pre-market safety testing, nor labeling; and that even federal judges have repeatedly ruled that so-called government "oversight" of crops such as Monsanto's sugar beets and alfalfa is basically a farce. According to informed sources, the CEOs of WFM and Stonyfield are personal friends of former Iowa governor, now USDA Secretary, Tom Vilsack, and made financial contributions to Vilsack's previous electoral campaigns. Vilsack was hailed as "Governor of the Year" in 2001 by the Biotechnology Industry Organization, and traveled in a Monsanto corporate jet on the campaign trail. Perhaps even more fundamental to Organic Inc.'s abject surrender is the fact that the organic elite has become more and more isolated from the concerns and passions of organic consumers believing that the battle against GMOs has been lost, and that it's time to reach seek a so-called "coexistence" between the biotech Behemoth and the organic community. The Natural Food's Dirty Little Secret - Most of the So-Called "Natural" Processed Foods and Animal Products They Sell Are Contaminated with GMOs. At the end of the day it's "bad for business" -successful lawsuits against GMOs filed by public interest groups such as the Center for Food Safety; or noisy attacks on Monsanto by groups like the Organic Consumers Association, create bad publicity, rattle their big customers such as Wal-Mart, Target, Kroger, Costco, Supervalu, Publix and Safeway; and remind consumers that despite any efforts, organic crops and foods such as corn, soybeans, and canola are slowly but surely becoming contaminated by Monsanto's GMOs. Retail stores and wholesale distributors have failed to educate their customers about the qualitative difference between natural and certified organic, conveniently glossing over the fact that nearly all of the processed "natural" foods and products they sell contain GMOs, or else come from a "natural" supply chain where animals are force-fed GMO grains in factory farms or Confined Animal Feeding Operations (CAFOs). Companies are maximizing their profits by selling quasi-natural products at premium organic prices. Organic consumers are increasingly left without certified organic choices while genuine organic farmers and ranchers continue to lose market share to "natural" imposters. It's no wonder that less than 1% of American farmland is certified organic, while well-intentioned but misled consumers have boosted organic and "natural" purchases to $80 billion annually-approximately 12% of all grocery store sales. There is no such thing as coexistence between GMOs and organics in the European Union. Why? Because in the EU there are almost no GMO crops under cultivation, nor GM consumer food products on supermarket shelves. And why is this? Because under EU law, all foods containing GMOs or GMO ingredients must be labeled. Consumers have the freedom to choose or not to choose GMOs; while farmers, food processors, and retailers have (at least legally) the right to lace foods with GMOs, as long as they are safety-tested and labeled. Of course the EU food industry understands that consumers, for the most part, do not want to purchase or consume GE foods. European farmers and food companies, even junk food purveyors like McDonald's and Wal-Mart, understand quite well the concept expressed by a Monsanto executive when GMOs first came on the market: "If you put a label on genetically engineered food you might as well put a skull and crossbones on it." The biotech industry and Organic Inc. are supremely conscious of the fact that North American consumers, like their European counterparts, are wary and suspicious of GMO foods. Industry leaders like Monsanto, Dow, and Dupont are acutely aware of the fact that every single industry or government poll over the last 16 years has shown that 85-95% of American consumers want mandatory labels on GMO foods. Why? So that they can avoid buying them. Industry lobbyists along with the Bush, Clinton, and Obama administrations have prevented consumer GMO truth-in-labeling laws from getting a public discussion in Congress. Although Congressman Dennis Kucinich (Democrat, Ohio) recently introduced a bill in Congress calling for mandatory labeling and safety testing for GMOs, don't hold your breath for Congress to take a stand for truth-in-labeling and consumers' right to know what's in their food. On top of this the "Revolving Door" between Monsanto and the Federal Government, includes Supreme Court Justice Clarence Thomas, formerly chief counsel for Monsanto, delivered one of the decisive votes in the Citizens United case, in effect giving Monsanto and other biotech companiesthe right to buy the votes needed in the U.S. Congress. The Organic Consumers Association, joined by our consumer, farmer, environmental, and labor allies, has just launched a nationwide Truth-in-Labeling campaign to stop the Biotech firms from force-feeding unlabeled GMOs to animals and humans. To pressure Whole Foods Market and the nation's largest supermarket chains to voluntarily adopt truth-in-labeling practices sign here, and circulate these petitions widely.